Sister Sophy works with handpicked partners that sell flowers, but also want to make the world a better place. We are proud that we have found some good partners in Europe. 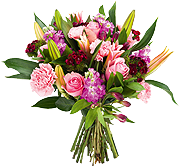 Select the partner in the country where you want a Sister Sophy bouquet delivered. We get the order directly from our partners and we make sure that the flowers will be fresh, perfectly and beautifully designed and packed in our exclusive shipping box. We will ship the flowers directly to your recipiënt doorstep.